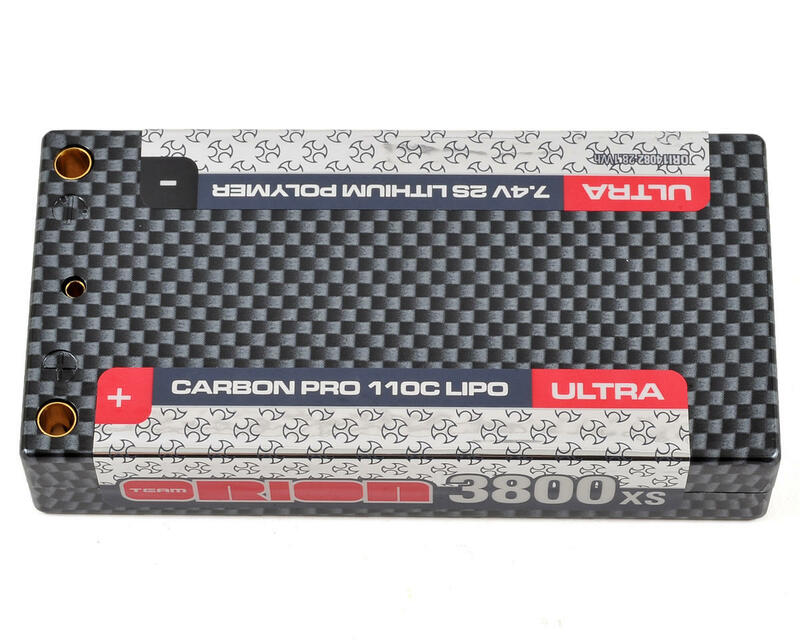 Team Orion Carbon Pro Ultra 110C batteries represent the latest development in Orion's Carbon Pro LiPo battery technology. 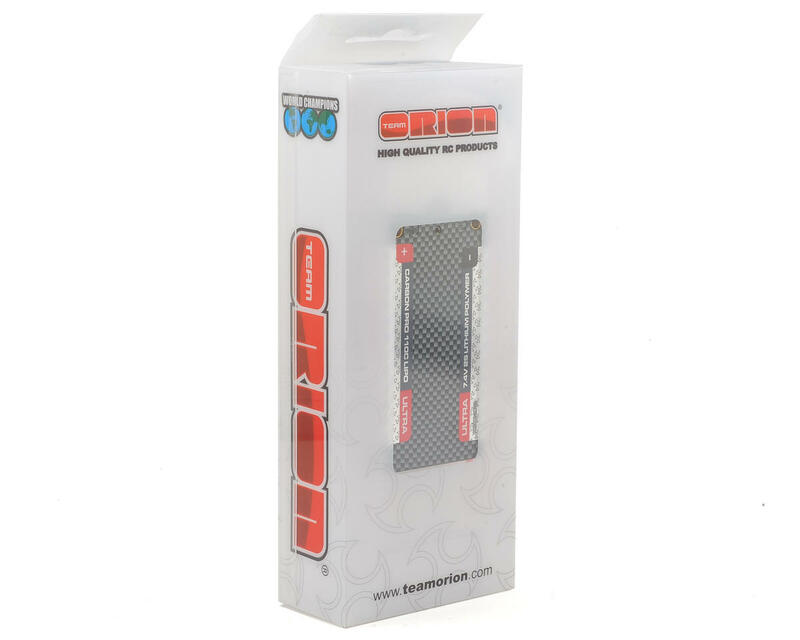 The “Shorty” battery format has become extremely popular and today it’s used in most of the racing classes. For this reason, Orion has developed a variety of shorty packs in different capacity/weight configurations that allow fine tuning of the car’s handling. A lighter car is generally a faster car, using a smaller battery allows you to save a lot of weight in a very efficient and cost effective way. To be honest I dont own this pack, Or any other shorty hardcase lipo. I just wanted to share a bit Of knowledge about lipo's and their storage state. When packs are New, they are in a deep storage state. When someone says they charged as recommended, Used and battery puffed, they did something wrong. First of all, a New lipo should be gently cycle several times before a first actual use. They are manufactured and put into a storage state, the chemistry is not yet as it would be, it takes several cycles before the chemistry is ready for heavy (race) use. Takes a bit of research to know but the information is out there. The best way to describe this is kind of a "burn in". Before this happens the ir is higher than it would be. The other rules are, do not exeed burst time, and do not discharge lower than 20%. If you follow these rules and balance regularly, your packs will last. I forgot to add, you should not exeed the burst amperage. You should also allow your batteries to cool down for ten to fifteen minutes between cycles. Have been running only 1 of these packs exclusively in low-traction 4WD buggy outdoor track conditions for just over a year. I always take care to charge/store packs safely so they will last longer, but I use them hard when racing. After 13 months of ownership, my current pack started to degrade and puff up. While this is slightly disappointing, I'll be ordering an identical battery to replace it. My opinion is that for the price, weight, footprint and power delivery of this pack can't really be touched by much else. I've had SMC packs last longer, but they're large and heavy workhorses where this is a lightweight race pack. 2wd, 4wd and ST with great results. I own 2 and 2 5000 packs. 2 months of racing 2 days a week and zero issues. Ive never had one of these last longer than 6 months. Awesome for the first couple of months, Pretty good for a few months after that and then just gets slower, and slower, and slower, and then puffs! I've used this battery for 1/10th 2wd buggy for 15 6 minutes heats and races on carpet. So far no issues and the battery performs great. As an aside I used a 4500 Orion shorty pack all through 2016 summer and winter races for a 2wd SC truck and 1/10 4x4 buggy and that battery has worked great. On the other side I purchased 2 new trakpower 4500 and both puffed up after about 20 uses in the same cars mentioned above. Bought Orion batteries because I heard they would give me an edge. Fact is they only have me a hole in my wallet. Batteries are garbage, buy anything else. Battery puffed up after first use. Charged as specified. Used for one 5 minute heat of 4wd buggy mod. 5000 did the same thing. Won't be buying orion again. there are such things as defective products, and there are such things as bad chargers and people who don't know how to charge batteries. i've been using these for months, in all shapes and sizes. everyone at my track runs them and it's pretty much all the hobby shop sells. take care of your batteries, cycle a few times before use, charge at 1C, store them at an appropriate voltage, and they will last a longgggg time. roberts correct, the best thing about modern r/c is lypo batteries the worst thing about modern r/c other than 17.5 is lypo batteries. the plug and play with the "no effort effect" of all the new tech has taken common sense out of the equation. motors batteries servos receivers and speed controls are just as sensitive to raw wfo power as the subs in your car are. so treat them the same way. i think the term he was looking for was "heat cycle" . give the chems and circuitry time to do their thing . if your in the nats and top five due to blown battery and you have to throw in a new one is one thing.but if your club racing, nobody's paying you or putting your pic in a magazine.. check your charger settings and very the cutoffs are set correctly..that's my nickle.